Jonathan Tufts and Ensemble. 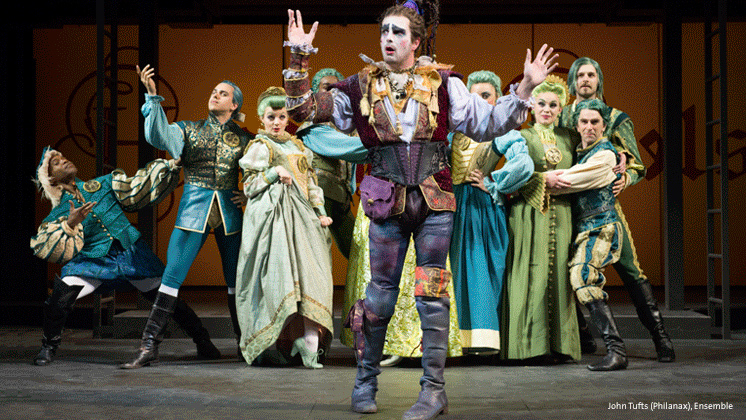 Photo by Oregon Shakespeare Festival. Head Over Heels is the latest saucy work from the razor-sharp, careful, sensitive, and insanely clever mind of Jeff Whitty. His inventive approaches to story telling are twisted and brilliant, and this Oregon Shakespeare Festival production exquisitely delivers pure fun. The play uses the Go-Go’s songbook as the source of its music, although Music Director Geraldine Anello has dramatically freed some of the arrangements from the original signature driving beat when Whitty’s book demands it. Head Over Heels is no drivelly biographic jukebox musical. Whitty says his book started with Sir Philip Sidney’s 16th-century pastoral romance, Arcadia, and the characters speak in iambic pentameter. Whitty also populates the story with traditional Shakespeare-like characters (clown, pushy daughter, sensitive younger daughter, etc.) But, the core to the play’s success are the family relationships and story twists and turns which are dangerously modern and exuberant. I could exhaust myself reaching for superlative adjectives that describe the intellectual frolicking onstage. I was giddy with the constancy of the subtle zingers in the script. Some were laugh-out-loud funny, others kept my face in a grin that hurt my muscles. All the excellent fluff is ENTERTAINING! But, Head Over Heels is subversive in the way it unveils the normality of a range of sexual orientations. The audience roots for the two couples of young lovers to overcome the obstacles to their coupling (which in each case is both a lack of self-knowledge and class). The fact that one couple is straight and the other lesbian is not even noted in the script nor in any reaction. Identifying a single outstanding character is problematic. The acting and singing was nuanced and strong. Jonathan Tufts (Philanax) as the fey narrator and clown was funny, obvious, and completely engaging. He plays against type and plays it just right. Bonnie Milligan (Pamela, the older daughter) belts out her character and songs, oozing with the self confidence of an un-selfquestioning older sibling. She’s great when she consoles Tala Ashe (Philoclea, her sister) over how much prettier she, Pamela, is. Bonnie is a large woman and made up to emphasize her bigness, while Tala is smaller and traditionally more attractive. Ah! There it is again! Another invisible cultural concept correction snuck into the script by Whitty. Pamela’s rating of herself as the much more attractive sister is never corrected or smirked at onstage. The audience knows her self-assessment is wrong,… but is it? No one in the play seems to think so. Now, back to the performances. All deserve praise! But, really Miriam Laube (Gynecia, the mother of the family) has to be singled out for doing an outstanding job, reminding us that she does not need to be in the title role or to be in center stage to own the scene. She was believable and fun. “Thank you!” to Michael Sharon (Basilius, the father), Dylan Paul (Musidorus, Philoclea’s beau), Tala, Britney Simpson (Mopsa, Pamela’s lust object), and Michele Mais (the Oracle). The actors and dancers who are not featured delivered energetic, tight, and fully wonderful performances, too. Heartfelt applause to all! Director Ed Sylvanus Iskandar was helped by the continuing collaboration of Whitty and the creative team, but that help doesn’t detract from the fact that he made all aspects of the production fit together as comfortably as an in an old classic. The set by Christopher Acebo focused the audience while giving the cast plenty of room to romp, dance, and play. It was masterfully useful. Loren Shaw’s outrageous, vivid costumes matched completely the words, music, and action. They were wholly over the top, but in a reassuring good way. Look at the sample of the costuming in the picture posted here… detailed and individual works of art. I also liked the treatment of the Go-Go’s songs. The occasional recasting and reworking of the tone let the depth of the music and lyrics become audible when the original versions served mainly as energy vehicles. Head Over Heels uses every bit of depth in the groups entire songbook to carry the show. If I have any concern it is that there is more enjoyable Whitty story than there is Go-Go’s music. Head Over Heels is quick, smart, and complex. It’s a must-see… but, if you don’t make it to Ashland, I bet you’ll be able to see it on Broadway. This entry was posted in osf, plays and tagged 5 stars, gay rights, Jeff Whiitty, LGBT play, World Premiere. Bookmark the permalink.